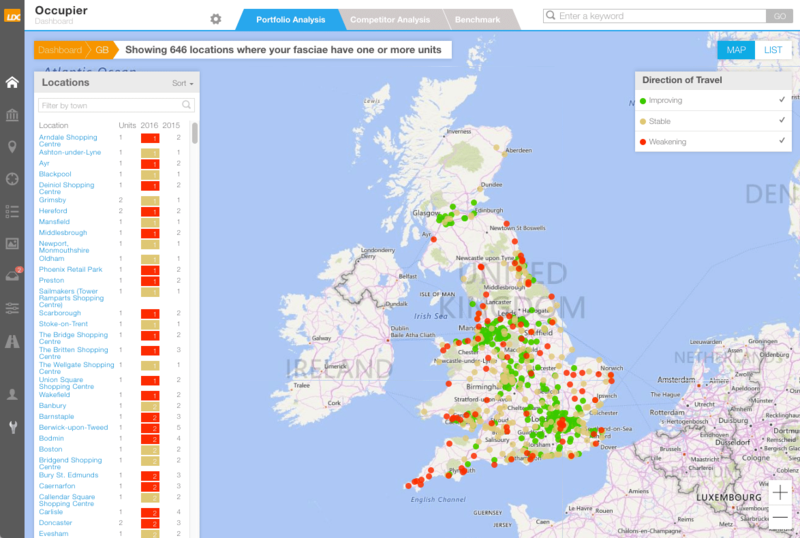 Analyse over 3,000 locations (including 700 shopping centres and 1,149 retail parks) across Great Britain through a combination of 12 dynamic data points, key in evaluating the performance and attractiveness of a location. What are the 12 variables and how can they be customised to meet my objectives? You can select which parameters to include or exclude from your Health Index score. For example you could include ‘charity shop presence’ in the index if this has an impact on the attractiveness of a location for your business. You can adjust the scoring range of any parameter which puts more or less weighing on that particular parameter. For example, vacancy is scored -10 to +10. This can be reduced to -5 to +5 or similar and will reduce impact of vacancy on the health score. Select which anchor retailers impact your Health Index score (these can be changed for retail parks, shopping centres and high streets). For example, if you know proximity to a particular retailer boosts performance of a location, you can add this into the health index. The current Health Index score methodology identifies any units vacant for more than 1 year as ‘persistently vacant’. However this can be amended to any number of years required. Adjust how the length of time of occupancy in a location impacts your Health Index. For example a location that has a high average vacancy time could be a sign of desirability. Add analysis of shops which are considered to be ‘undesirable’ or are known to have a negative impact on your locations into your Health Index. For example, if proximity to fast food restaurants impacts sales negatively for your business, this can be included in the index. Adjust the drive time catchment area in which competing shopping centres or retail parks should influence the Health Index score. For example increase the catchment from 20-30 minutes to capture more competing locations that could make a location less/more ‘healthy’. Include any department stores which are known to influence your locations and adjust the weighting of each different store (either positively or negatively). The benchmark percentage of premium vs value retailers in any location can be adjusted, according to relevance to your business. For example, a higher percentage of value retailers in an area may be beneficial for your business. With regards to the existing portfolio, LDC’s Health Index is incredibly valuable in identifying stores within your portfolio which are at risk, given the changes in that location. It can also flag stores in locations which are improving and therefore offers a unique overview of the portfolio and its relative strengths. Then moving forward LDC’s Health Index is used by many occupiers to benchmark the potential of future locations. This index is an invaluable feed into any analogue or store forecasting model. Identify and understand the health and sustainability of assets whether they are part of their existing portfolio or potential acquisitions; matching specific investment criteria. Identify strengths and weaknesses in and around the particular asset. Understand whether the asset is in a stable, strengthening or weakening location. LDC’s Health Index is a valuable tool that enables investors and asset managers to understand and track attractiveness and sustainability of assets over time. As a business you could build a company owned index which can be applied to over 3,000 GB locations through the LDO platform, including town centres, shopping centres and retail parks. The ability to bespoke the health index allows for accurate assessment of investment/divestment opportunities in line company specific views and criteria. The Health Index is assessed and updated on an ongoing basis (6 or 12 months) which allows investors to track continuous performance as well as understand risks and opportunities as they arise. Finally, the bespoke health index capability enables you to benchmark your portfolio against sector averages, competing centres or a set of centres e.g. Top 100 Shopping Centres. This capability is often used to feed in external investment reporting. As early adopters of this great technology, we use LDC’s footfall devices to gain an accurate understanding of footfall flows past our restaurants. We get a really valuable source of data which enables us to drill down into performance so that we can tailor our activity to each particular restaurant. For example, the granularity of the data enables us to accurately understand traffic flows during every trading hour and also to be able to compare across our estate - that’s very useful on so many levels. Over the past year, LDC have provided strong support and are always willing to take on our feedback to provide maximum value, resulting in a true partnership approach. Track the impact of external activity and understand how location, people and environment drive sales.